Based on years of experience and information received from the Spirit collaborators of Rev. James J. Dickson, San Francisco materialization medium, whose daylight phenomena marks a distinctive epoch in the annals of psychic science and Modern Spiritualism. Spiritualism in all its phases, continues to push forward the frontiers of man's knowledge! Through Spiritualism's phenomenal phase known as Daylight Materialization, it has attracted world-wide attention and attained unquestionable scientific status, for one of the tenets of science is, that what is held to be true should be capable of proof. The religion of Spiritualism holds that man as an individual survives the incident called "death," retains his personality and memory intact, and returns in Spirit form to give mortal man evidence (phenomena), and knowledge (philosophy), of Life Eternal. The Spirit World proves the assertions of Spiritualism, through mediumship. The materializing mediumship of the Rev. James J. Dickson, Pastor of The Spiritualist Church of Revelation in San Francisco, California, has unfolded to such an extraordinary extent, that Spirits usually seen in softened light can now, under proper conditions, be seen in daylight! Yes, through the world-renowned mediumship of Rev. Dickson, Spirits materialize in full form in daylight and converse with their loved ones of earth, whether in his public or private seances, or while he is visiting socially with friends. What greater proof of Eternal Life could be desired ? Daylight Materializations are not new to many of the Rev. Dickson's followers, for in the half-century that he has been giving his public and private materializing seances such daylight manifestations through his psychic power have been reported innumerable times at his public church meetings. In one of our meetings a daylight manifestation was reported that occurred in the downtown offices of the well-known Dr. Joseph G. Lehner, while his friend, Carl Schyberg, was present. Dr. Lehner said: "Carl and I were pleased when the Rev. Dickson called at my office one afternoon, and while we three were talking, the voice of Juanita (guide of the Rev. Dickson), came to us from across the room near the windows." The doctor said they turned in that direction and there she stood! (While he was relating the incident, the deep emotion which filled him was evident in his voice). Dr. Lehner continued: "I shall never forget how beautiful Juanita looked in the daylight. The pink robe she wore revealed the soft contour of her lovely Spirit form, and her lustrous dark hair, caught back on the right side of her face by a cluster of flowers, hung in soft waves below her shoulders. As she said 'Juanita' she smiled and extended her graceful arms and hands. Then, as we silently watched, she blended into the afternoon light." "We were lying on the sand in our trunks in a secluded nook, enjoying the sunshine," he said, "when we were startled by the voice of the Spirit, Minnie Brown, (the Rev. Dickson's cabinet guide), who asked: 'Can all of you see me?' From our recumbent positions we looked up," said Mr. Schyberg, "and there was beautiful little Minnie standing on the sandy beach nearby. Her Spirit form and garments glistened in the sunshine until she faded into its brilliant rays." The great, and continued response from all parts of the world, following publication of the account of the Rev. Dickson's daylight materializing seances and the phenomenal pictures taken in bright light (by flashlight), in the October 25, 1950 issue of PSYCHIC OBSERVER, indicates the great desire for knowledge of Daylight Materialization, and has prompted the writing of this article. Such knowledge, can only come from those who present the manifestations, namely: our own Spirit loved ones, and the Rev. Dickson's Spirit guides, Minnie Brown and Juanita. "There is no phase of mediumship more unique than Spirit Materialization," said Juanita, "and no meeting more sacred that a materializing seance. Such seances give those who seek, an opportunity to hear, see and speak with their Spirit loved ones face-to-face, thus proving that Life is Eternal." Juanita has said: "Nothing is more of a reality than Spirit Materialization, but when we begin to explain how Spirits materialize we enter the Realm of the infinite, for the entire phase of Materialization involves spirit laws, not relative to man's material world, as well as physical laws." And, she continued: "Materialization should be within the comprehension of all mankind. It is a deplorable fact that it is not, because of the ignorance in which the majority of mankind slumber." "Daylight Materialization," said Juanita, "is Materialization at its zenith. And, of course, in the Rev. Dickson's daylight seances which have brought him global attention, as well as in all of his materializing seances in softened light, neither his voice, brain nor body are used, the form and voice belong to the manifesting Spirit alone. And this was clearly demonstrated by the Spirit, Minnie Brown, cabinet guide of the Rev. Dickson, when he called, recently, upon Dr. M. A. Bulman, writer and student of psychic science. The remarkable demonstration was told by the doctor and the doctor's sister, Nellie, at a public meeting of our Church, The Spiritualist Church of Revelation in San Francisco, California. "One afternoon last week," said the doctor, "the doorbell rang, and when I opened the door, there stood the Rev. Dickson. I invited him to come in, and after he had closed the door and we exchanged greetings, I heard several more voices, those of my Spirit friends, for Rev. Dickson was alone. He came up the stairs in the broad daylight, and when he had reached midway, out from behind him, fully materialized, came little Minnie Brown wearing a blue dress! Minnie said, 'Good afternoon, Dr. Bulman,' in a loud clear voice, and preceded the Rev. Dickson up the stairs, Minnie arrived at the top landing well before he did, passed me, and went down the hall toward my sister." "I heard many voices, and was on my way to see who had come in. Just as I stepped into the hall, I beheld the wonderful manifestation of the Spirit, Minnie Brown, and a tide of ineffable joy swept over me, for she is such a beautiful child! You cannot imagine how delighted I was! I stood still as she approached, and not until she came up quite close to me, did she vanish in the daylight." All who have seen the Spirit form in the light of day, agree that it is a marvelous revelation of celestial beauty, for to see it in daylight, is to view it in the superb splendor of technicolor as compared to the greyed tones seen in softened light. The highly developed psychic power of the Rev. Dickson allows departed loved ones to reveal themselves in sunlight, and gives them (so they tell us) inexpressible joy in being able to show their true beauty. The Spirit World has at last succeeded in bringing Spiritualism into the scientific era long desired, for with the question of light ceasing to be a requisite upon which Materialization is contingent, the Spirit loved ones have the opportunity of presenting eloquent and unquestionable evidence of Life Eternal, literally in the sunlight! At a recent Class meeting at our Church, for the unfoldment of psychic power, a well-known California woman, Louise J. Barricklo, told of an outstanding Daylight Materialization which occurred in a private seance she had with the Rev. Dickson at his home, 2940 Nineteenth Avenue, San Francisco, California, on July 4, 1951. "Juanita said: 'Ectoplasm is a substance composed of many known elements and many elements of which man is not as yet aware, and is produced through the action of the physical sphere of the medium upon the raw material of human vibrations. In Materialization, ectoplasm is used by a Spirit to amplify, intensify or 'stepdown' the appearance of its form, so that it can be brought into the limited range of human sight. Man's acuity is suited to the needs of his normal earth activities. For purposes which require his greater observation of penetration, man has developed sensitive instruments which extend the range of his sight, such as the microscope and telescope. A materializing medium, such as the Rev. Dickson, is the sensitive instrument used by the Spirit World to bring the Spirit loved ones within the range of human sight for man's enjoyment and education.
" When a Spirit wishes to materialize in the bright light of day,' said Juanita, 'it exerts a gravitational force and draws a film of ectoplasm from the Rev. Dickson into close proximity with its form and garments. The Spirit then raises the temperature of the ectoplasm to the degree where every atom of sunlight, upon contact with it, causes combustion, and the infinitesimal explosions which result, produce the fluorescence which plays upon and illuminates the Spirit form in daylight. "The delicate transparency and fluidity of the ectoplasm produced through the mediumship of the Rev. Dickson, for Daylight Materialization,' said Juanita. 'enables the manifesting Spirit to show the color, texture and pattern of its garments, the flowers, feathers or jewels used in adornment, and all other minute details. And these same qualities of the ectoplasm allow the Spirit's features to be seen. "In the materializing seances of the Rev. Dickson, when a Spirit releases the force which holds the ectoplasm in proximity to its form and garments, what is called "dematerialization" occurs. Only the ectoplasm has "dematerialized," however, the Spirit's form and garments remain intact, although not visible to human sight. Drawn there by the Spirit workers, the released ectoplasm returns to the medium or materializing cabinet, to be used by other Spirits wishing to materialize. 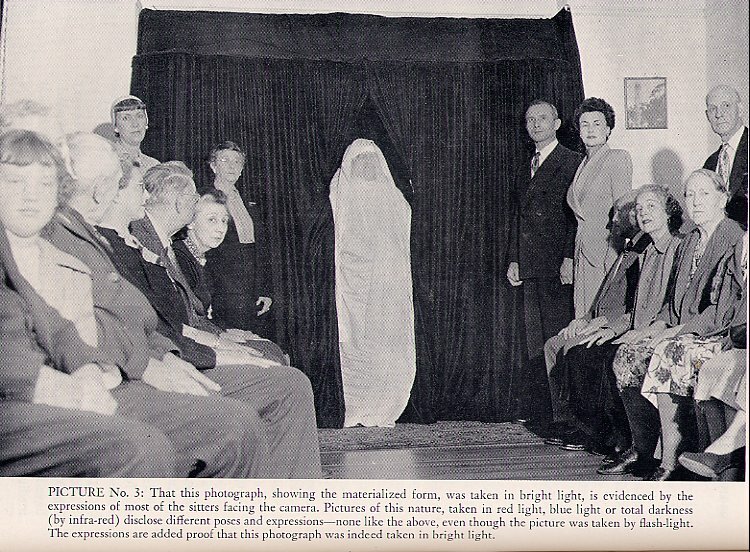 "At the conclusion of the seance, the Spirit workers return certain vibrations to the audience, or sitter, whence they were drawn, the vibrations having only been borrowed for the purpose and duration of the seance. " Daylight Materialization! What a magnificent field of grandeur to invade with the assistance of Spirit friends. In man's conquest of fear and finite limitations, Daylight manifestations give knowledge which illuminates his understanding and energizes his psychic power. Spiritual phenomena of such pure beauty, causes puerile dreams or fancies to vanish, and awakens man to the realization that earthlife is but the material interlude—the physical event—in man's Eternal Life. Mankinds' knowledge of the Spirit World, through Spiritualism, already so imposing, could be radically transformed through Daylight Materialization, and those with vision, see humanity advancing rapidly toward a new and enlightened era. As future generations mark the progress of Spiritualism, the Rev. Dickson's achievement as a Daylight Materializing medium will stand among the great. And how well he deserves the praise and acclaim of the world at the present time, for his entire life has been devoted to preserving the purity of Spiritualism's phenomena, and presenting the truth about Life Eternal as given directly by materialized Spirits, in face-to-face communication! "I'll materialize to you again sometime, dear. Don't forget me." She waved her hand, and vanished. I later described this experience to Harry Rayne, the metaphysics lecturer. He replied by telling my sister, Nell, and me about the Rev. Dickson's remarkable phenomena. We attended a seance of this medium at the first opportunity. I cannot remember when I spent a more fascinating evening. I saw four and five Spirit forms in flowing exotic garments simultaneously appear out of space and emerge through the floor. I watched them move about with fantastic grace, instantly alter their garments and adornments before my eyes, then disappear through the wall or vanish in the air. With each Spirit that appeared, I wondered what new physical impossibility it would perform. "My children, we have been trying for a long time to get you to one of the Rev. Dickson's materialization seances. When we found that Mr. Rayne knew about the Rev. Dickson, we impressed him to tell you about them. "We have some marvelous sights in store for you." When mother disappeared, a little girl materialized. "Minnie Brown," she announced. It was the child of long ago. Minnie chose not to speak of that manifestation then. She had a more impressive occasion in mind. Nell and I, intrigued with the manifestations we had witnessed, became charter members of the Rev. Dickson's church, The Spiritualist Church of Revelation, Incorporated, San Francisco, California, and, for the next three decades, enjoyed the ultimate in phenomenal mediumship. We obtained beautiful independent slate drawings in broad daylight by Juanita, the medium's artist guide; we witnessed superb spontaneous phenomena with the medium in our home; we sat enthralled before the enchantment of his Spirit dances. In the spiritual satisfaction of these wonderful events, we thought our cup was overflowing. Then came the Rev. Dickson's popular broad daylight materialization seances. Before the majesty of the Spirits materialized in full sunlight, all other phenomena was secondary. One bright early afternoon recently, I accompanied Nell to the Rev. Dickson's home for a private materialization seance. Upon arrival, Nell went directly into the seance room. I remained in the dining room to talk with Mrs. Gertrude Dickson. After a time, Nell excitedly called to us to come into the lounge adjacent to the seance room. We hurried in. Standing there beside Nell in the middle of the sunlit room was our mother fully materialized looking exactly as we had known her in earth life. I gazed upon her smiling countenance, upon her blue-lace form-fitting short sleeved gown, upon her center parted hair arranged with jewels at the sides. I was overwhelmed. "Now everyone be seated," she calmly said. "We'll visit for awhile." "You see, my children, I have not changed. And I love you as always. To be able to materialize in the sunlight like this gives me more joy than you can understand. I should like to remain a long time and tell you all about the beautiful life I found on the Spirit side, but I cannot. Follow me into the seance room." Across the lounge and through the door after this lovely Spirit we filed. In the seance room mother walked to the side of the Rev. Dickson fully conscious in plain sight beside the cabinet curtain. There she bade s farewell, and disappeared. Little Minnie Brown in a pink dress immediately stepped from the cabinet. "Hello, everyone. Dr. Bulman, when I materialized on your bed that time, I told you I would materialize to you again." She gently rose several feet from the floor, and, before our spellbound eyes, floated across a sunlit window onto a small table on the opposite side of the room. There she stood smiling at us. Not long did she hold our attention. Out of space before Nell materialized a full-dressed Indian chief. We gasped. "Pale Moon." announced my sister's guide. In all my experience with the Rev. Dickson's phenomena, this materialization was the most spectacular. Pale Moon was perfectly lifelike from the tip of his towering bonnet to his beaded moccasins. Standing there in that little seance room with the sunlight shining on his Spirit form, he was a magnificent sight. I gazed into his keen black eyes and rugged sunburned face; I beheld the splendor of his feathers and the brilliance of his blue blanket. Emotion swelled in my throat. "Oh, you're glorious!" exclaimed Nell in ecstasy. "What a materialization," said Mrs. Dickson. "We've been wanting to give you a demonstration like this for a long time," said Pale Moon. "We had to wait until the vibrations were just right." "Look at Minnie," said the Rev. Dickson. We turned to Minnie. Now she was only materialized from the waist up. She was blending out into the wall. "You don't know which one of us to watch," she laughingly said. Pale Moon now removed his blanket revealing beneath a beautifully beaded buckskin suit and many bright necklaces. "See my blanket," he said, holding it up to the side. "It was my special design." The blanket was indeed extraordinary. Against its blue field was a center white half moon surrounded with stars and a red horizon border. As we admired the blanket's design and texture, it suddenly vanished, and Pale Moon slowly blended out into the sunshine. About a year ago, the Rev. James J. Dickson and his wife were spending a quiet evening with me at my apartment on the fifth floor at Bush and Leavenworth, San Francisco, California, when materialization spontaneously occurred. "Maria, I shall try to bring some of your spirit friends to you, if you wish." "But Minnie, I have no cabinet curtain," I replied. Throughout the seance that followed, the Rev. and Mrs. Dickson sat near me. Maria Alexander and I could see them at all times. "Can you see me, darling? I have not changed." "I certainly can see you, sweetheart," I replied. "I've never seen you so clearly." "I am very happy in the Spirit Realm, Maria, dear. I stay near you so I can help you through the material life, and will stay with you as long as you are in earth life. When it comes time for you to pass into the Spirit Land I shall be there to receive you, then we shall be together forever. I love you, dear, very deeply. How grand it is that I can materialize in your home and talk with you." "This is beyond all my expectations. I am thrilled," I replied. Chase greeted the Rev. and Mrs. Dickson, bade us good night, and vanished without moving from the spot where he stood. Next, my daughter, Arleta, materialized. Holding out her beautiful feminine arms, she walked over to the electric lamp. "Look mother," she exclaimed. "Look how wonderfully I can reveal my spirit form to you here in the light." "Yes, Arleta, my darling," I answered. "To see you so clearly here in my home is something I never expected to happen." After Arleta and I exchanged a few love greetings, she walked into the center of the room, and just blended out before our eyes. While we were discussing the manifestations, Mrs. Dickson's Guide, Rosene, appeared in flowing robes and high-combed hair. She walked with heavenly grace and stately elegance about my apartment imposing fantasy upon the old familiar scenes. After talking with us a few minutes, she suddenly disappeared. Up to this time, my little dog, Penny, seated in my lap, had watched the spirits quietly. As the Angels moved about, she turned her head, and when they spoke, she listened attentively to their melodious voices. But now a dog barked. At the Rev. Dickson's feet slowly materialized a toy bulldog. It was Tony, the medium's beloved little pet. Penny wriggled with excitement and tried to get down. In my fondness for dogs, I aided time and again in Tony's care during the last days of his earth life. To see the little dog materialized now at the Rev. Dickson's feet was a touching sight. Tony barked again, and vanished. Although I had been a Spiritualist for nine years previous to attending the Rev. Dickson's materializing seances at his church, The Spiritualist Church of Revelation, Incorporated, 1762 Page Street, San Francisco, I never dreamed manifestations such as I have seen in his public and private seances were possible. The precious home seance was the prelude to phenomenal wonders. "Maria, I will now show you my form in the daylight." He walked over to the locked door, turned the key, opened the door wide, and stepped into the daylight-flooded doorway. "How do you like this, Marie?" he asked. "Dr. Adams," I exclaimed. "What a wonderful sight! You're young again. You haven't changed otherwise. You're as tall and slender as ever." "Yes," he replied. "I'm more than six feet, dear, and not fat, as you see." As I gazed upon his splendid youthful form, Dr. Adams stepped to my side, walked completely around my chair, and faded from view. Once having seen daylight materialization, so far did the spectacle surpass all other phenomena, I kept hoping for a full daylight seance. Eventually my wish was fulfilled, but for what occurred at that meeting, I was totally unprepared. On September 23, 1952, about 2:30 PM., I went to the Rev. Dickson's for another private materializing seance. I entered the seance room, saw the sunlight streaming in through the large uncovered windows on each side of the cabinet, and turned to the Rev. Dickson questioningly. "The room is not prepared for my seance." "Minnie Brown told me that you are to have a daylight materialization seance today," he replied. Juanita, the Rev. Dickson's lecture and artist Guide, had once told me that to get good daylight materialization, the sunrays should be shining directly onto the Spirit form. It seemed to be the ideal time for such a manifestation. My heart thumped with excitement. Unlike ordinary softened-light seance procedure, the Rev. Dickson, in this instance, did not pass into a psychic sleep. He sat fully conscious in plain sight throughout the seance. He and Minnie Brown talked with me when I was not talking to my Spirit friends. The curtains parted, and out into the sunshine stepped my Guide, Wewanna, an Indian princess, wife of my Indian Guide, Black Eagle. I have never seen anything so glorious. Wewanna was so life-like in color, contour, and movement she might have emerged from a wooded glen, yet, her whole being was of an indefinable exquisiteness that transcended anything material. I gazed enthralled upon this enchanting Indian princess. Wewanna wore a long full dress of bright red, yellow, blue and black block-like Indian designs, gathered at the waist by a beaded belt with designs that matched ornament designs interwoven into her long shoulder braids. Beaded neck strands dangled low over her full feminine form. How picturesquely did her garment and adornments contrast with her brownish-olive skin and lustrous dark hair. This scintillating exciting entity, this dainty glamorous Indian princess stepped forward, looked at me with her lovely dreamy black eyes, and with beautiful shapely arms and hands held out her skirt. In silvery tones she called my attention to its fascinating texture, design, and intriguing sparkle in sunray angles. Three times she repeated this performance. I looked and looked again. Surely, no grander spectacle had ever been beheld by man. I sat transported, carried away. The celestial delicacy, the radiating colors, the ineffable sweetness of this Indian princess from the Land Beyond defied the language. Words had yet to be coined to convey the magnitude of a spirit fully materialized in daylight. When Wewanna's appearance ceased, it seemed that heaven's door, thrice ajar in my behalf, had latched forever. An experience such as this is deeply stirring. Here was mediumship at its zenith. Here, in broad daylight, by appointment, material laws were pierced. Here, in broad daylight, by appointment, I was seeing a visitor from the Land Beyond, a gorgeous gaudy Spirit with the sunlight playing upon her being. This was Spiritualism in all its glory, wooing the heart with its gentleness, fascinating the eye with its revelations, assuring the fear that fear is unfounded, challenging the scientific with its mysteries. Now from the curtains into the sunrays stepped a spirit completely enshrouded with white ectoplasm. This materialization, following Wewanna, came as a surprise. It turned out that the spirit was presenting a phenomenal demonstration within phenomena to excite the experts. How many times has the question been asked: What does ectoplasm look like in the light of day? Here was the answer. The ectoplasm about the spirit before me, while dimly transparent here and there, was, as a whole, intensely white, and so reflecting of the sun, it dazzled the eyes. Beneath it, the features of the manifestor were indiscernible. "Dr. Creely," the spirit announced. I greeted an old friend. Ectoplasm-enshrouded Dr. Creely walked over before the sunray-piercing window, and there demonstrated in a most spectacular way. He commenced to pull, with graceful gestures, portions of ectoplasm from his being, exposing by degrees his spirit form to the glorifying sunrays. He continued these movements, draping meticulously the withdrawn ectoplasm over his arm, until nearly all the ectoplasm was removed from his form. In the end, the spirit, Dr. Creely, stood quietly before me, dressed in a dark brown business suit, every contour in proportion, every molecule atint, a scintillating rhapsody of psychic science with folds of dazzling white ectoplasm draped over his arm! What a spectacle! What a demonstration! Lest the essence of this manifestation be obscured by its brilliance, what Dr. Creely revealed was the difference between the fleecy ectoplasm usually seen in darkened, seances and the extremely thin, invisible layer of ectoplasm with which the spirits cover themselves for daylight materialization, that the sunlight, in striking the substance, bombast into human perception the spirit form and celestial coloring beneath it. This demonstration was the most penetrating yet of the vibrations stepdown process used by the Spirits in materializing. "Isn't that a grand manifestation of daylight materialization." "It takes a lot of psychic power to produce a materialization like that." Dr. Creely added: "It was my special demonstration for you, Maria, for I knew you would appreciate it. When Dr. Creely faded out into the sunshine, Areleta's father stepped from the cabinet. There, in the sunlight with that familiar tuft of brown hair hanging as always over his forehead he was wonderful to see. "Hello, Ben I greeted him. "you haven't changed a bit." "I tried to come just as you knew me on earth so you would recognize me," he replied. Ben and I talked for a few minutes, then he returned to the cabinet. I shall never be able to fully explain all I saw and heard on that sunny afternoon at the Rev. James J. Dickson's. The one thing I do know is that when I think of those glorious daylight-materialized spirits, my heart sings out with joy, and I feel an inner peace deeply comforting and enrichening of my life experience. In the private materializing seances given by James Dickson at 2940 Nineteenth Avenue, in San Francisco, California, my departed loved ones materialise so clearly and plainly in the broad daylight that I recognize them immediately without difficulty. Recently, at a private seance with Dickson, my father materialized in the bright daylight. He was grand ! He was as natural as he was in life. We talked about many experiences of my childhood, which brought back memories I had almost forgotten. My aunt materialised following my father, and gave her name in full. She walked over to me, entirely encircled the chair on which I was seated, and then continued over to a table in the room upon which were a number of Spiritualist magazines. Four separate times she picked up different magazines. Then she came over to where I sat with a copy of TWO WORLDS in her hands and together we discussed the picture on the front page, and read excerpts from various articles appearing therein. Daran La Gan, my guide, then materialised and seated himself on a chair near me. We talked for a considerable length of time about his picture, which Mr. Dickson's spirit guide, Juanita, had drawn for me on my slate, again in bright daylight; and during our conversation, Minnie Brown, Dickson's cabinet guide, materialised and joined us. As you may guess, I was delighted to witness the manifestation of two materialised forms at once for a few moments, during this outstanding seance. James Jacob Dickson with his materialized spirit guide Minnie Brown. Photo taken 1899. Dickson age 19. After Minnie Brown returned to the cabinet, Daran and I spoke of the many times he has materialised for me in my garden, in the bright moonlight, and also the wonderful demonstrations he gave me recently when, for one entire week, he opened and closed the door for me, every time I entered or left my home. "Soon I'm going to show you my form in the bright daylight, dear, when you are out in your garden, so watch for me." During the following week, one sunny morning, while I was working in the garden, my attention was drawn to a lady walking on the pavement nearby. To my surprise and delight, I recognised her as my mother. She continued to walk along the sidewalk, sweetly smiling at me, till she blended away into the sunlight. At the very next seance I had with Mr. Dickson, my mother confirmed her daylight appearance on the sidewalk in front of my home, before I had the opportunity of speaking to her about it. Carl D. Schyberg, the author of this article, has known James Dickson for over 25 years. In that time he has witnessed so many remarkable phenomena that he has come to wonder "What next?" Yet despite his knowledge of Dickson's capabilities Schyberg could scarcely have visualized the fantastic phenomena which unexpectedly occurred one night—fully materialized figures walking about his apartment at four in the morning while the medium was fast asleep. We were homeward bound from vacation—THE REV. DICKSON, MR. AND MRS. JENS M. SVENDSEN, AND I—WHEN THE AMAZING PHENOMENA OCCURRED. We stopped for the night at Balboa, a seaside resort in Southern California, and were lodged in a luxurious, upper three-room apartment, composed posed of a kitchen, a bedroom, and a large living room adaptable for two beds. Tired from a long day of traveling we had retired early, the medium and I in the living room. At a quarter to four the next morning, I heard a voice: "Carl! Carl! Wake up! Wake up!" I opened my eyes and saw Geolga Emenoff, my guide, fully materialized beside my bed, bending over me. Her form was illumined by light from an opposite apartment. The blue of her eyes, and her blonde curls, could be clearly distinguished. "I want you to get up and open the door to the Svendsen's room. Juanita wants to materialise and talk to them," said Geolga. I arose and looked over at the Rev. Dickson, asleep in his bed. Something splendid was imminent. Geolga vanished, and Juanita, Dickson's guide, appeared. "I'll follow right behind you," she said. With her materialised spirit at my heels, I went to the door, called and entered. Juanita was now all of thirty feet from the medium. She greeted the Svendsens, then returned to our room. I followed. There, in the inflooding light and general full-moon radiance, Juanita leisurely walked about. She wafted a panel of her gown; she fluffed out her black, wavy tresses; she brushed at her slender waist with exquisite fingers. After a time I walked over to where the Rev. Dickson lay on his bed asleep, and we all listened to his raucous snore. Juanita then dematerialised where she stood. Thinking the manifestations had ceased, I closed the Svendsen's door and started for bed. Then my "dead" wife, Mae, appeared at my side. As in life, she looked up into my face. To see her now again, every feature as I knew it, was heavenly. Briefly we conversed, she extended love to our girls, then she vanished. Now the Rev. Dickson startlingly awakened; when I related events he calmed. We went into the Svendsen's room to discuss the manifestations. Presently I left the group and went to the kitchen for water. When l switched on the light-there stood Geolga, fully materialised! And she spoke to me. I returned to the living-room, related Geolga's manifestation, then we all retired and quiet prevailed. Then again, suddenly, I heard the laugh of Minnie, the Rev. Dickson's little cabinet control. I looked over, and saw her, a child of seven, standing beside the Rev. Dickson's bed. The medium and I both greeted her. Minnie summoned the Svendsens, and they, with us, observed her until she dematerialised in the center of the room. The Svendsens then closed their door. Now from a light on the rug there arose a form in a brilliant blue and gold costume, and a long, black beard—an ancient of no little dignity. "Jared Chaldea," he said in a deep voice. It was Mrs. Svendsen's Persian guide. "I'm going in to talk with Ruth." Majestically he strode to the door, opened it, entered, and greeted our companions. After a bit he reappeared, banged the door behind him, and, returning to the spot where he had materialised, melted to the floor. Next to manifest was a spirit in a coral gown with a long train, a scintillating tiara, and a glittering bracelet. "Orly Vanene," she said. This time it was Mr. Svendsen's guide. "I'm going in to talk with Jens." She went to the door, opened it, entered, and spoke. Reappearing, she strolled about our room. With her long train and dainty hands she was a rapturous sight! I shall never forget it! She returned to the Svendsen's room, reappeared, banged the door behind her, and in the center of our room, dissolved. Now Chief Mohegan, another of my spirit friends, appeared in an elegant feathered headress; simultaneously, Little Fawn revealed herself in white buckskin, sitting on the lounge. With this superb double materialisation the phenomena ceased. The next day we drove up to Los Angeles and found lodgings in separate motel apartments. That night, shortly after I retired, Geolga appeared sitting on my bed. "I want you to come with me into the Rev. Dickson's room," she said. I arose, entered the medium's room, and, side by side with Geolga, stood looking down at the Rev. Dickson asleep in his bed. At Geolga's request I raised a window to provide the medium with more air, then retired. Minnie now peaked around the door and giggled. After her appeared my wife and Chief Mohegan and Little Fawn, Orly, Jared and Juanita. They walked around my room, leaned against the wall, sat on the chairs and the bed. It was glorious ! An unforgettable experience. I read about James Jacob Dickson some years ago and was wary as the book was written by hinself. I never published any of the material on him as I could not find independent verification of his claims. I do know that, if it was true, Maurice Barbanell would have been on the first plane to San Francisco at the earliest opportunity and his resulting article(s) would have made headlines in "Psychic News" or "Two Worlds" whichever one Barbanell would have been editing at the time. There is no mention of this medium in any of Barbanell's books even though he visted America and sat with Ethel Parrish Post (Camp Silver Belle) and walked arm-in-arm with the materialised form of Silver Belle the length of the seance room and wrote about his experiences. The article sounds fantastic but until someone produces independent verification I reserve judgement. Absoolutely Z his are the only references to be found anywhere and primarily now on the survivalebooks.org. Of course this is the worry about looking back at many things unless there is adequate corroboration. Admin wrote: Absoolutely Z his are the only references to be found anywhere and primarily now on the survivalebooks.org. Of course this is the worry about looking back at many things unless there is adequate corroboration. Dickson's book was published in 1954 and runs to 85 pages. Interesting book, Jim. When considering Duguid take a look at Fodor's references as well. The Cassells Family Bible incident amd other artistic references illustrate the anomalies inherent in physical mediumship. Interesting that Frank Podmore had already decided back inthe 1880's that this is the way it was done Duguid allowed no other persion to put their "profane" hands on the cards. Somewhere in this has to come back to the references to his character and aptitude for his day job which was always safe whilst his boss was actually one of the key figures in Duguids Spiritualist Circle. I supose that I am taking rather a different view point of Duguids Mediumship to that taken in the recent PN article by Graham Jennings although yet again I can see the classic problems of the "Dark Seances"